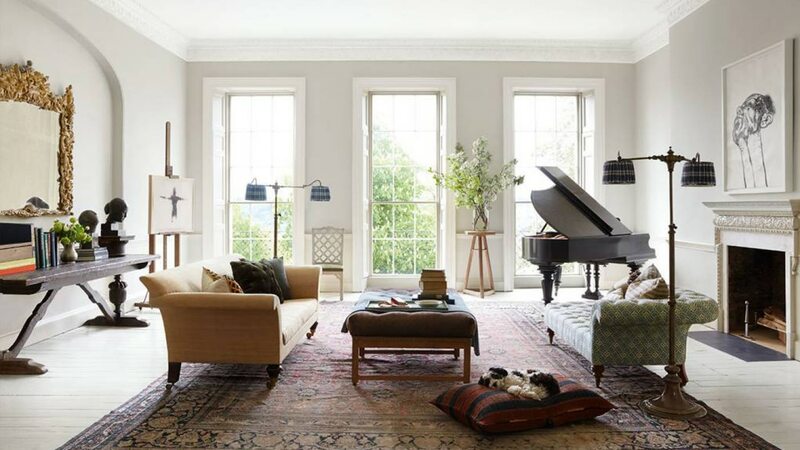 As seen in House & Garden Magazine, Architect Jonathan Rhind and our clients Harding and Read have transformed this eighteenth-century townhouse in Bath. The property was previously a hodgepodge of student rooms but by adding characterful furniture, reclaimed vintage lighting by us at skinflint, and clever combinations of colour, it has been transformed into an inspiring modern interior. It’s hard to imagine this family home carved up into small student digs as it was in 2013 when it belonged to the University of Bath for over sixty years. But music producer Nick Gilpin and his wife Catherine alongside interior designer Nicola Read and a team of builders set about on a three-year project to release the building’s potential set on one of Bath’s Georgian crescents. Farrow & Ball pinks - ‘Smoked Trout’ and ‘Setting Plaster’ - give warmth to the light-filled dining room and kitchen. Elsewhere, the dark blue/black ‘Squid Ink’ by Paint & Paper Library have been used in areas such as the hallway, pantry and bathroom, the hues of which are picked up in other rooms and details throughout the home. For the kitchen scheme which was designed by Plain English, a set of three of our Eastern Bloc pendant lights - which were salvaged from a factory in Hungary - are suspended above the island unit, providing feature lighting and illuminating the surface below. Read the full article in House & Garden Magazine.